On Monday, many of Uber drivers refused to work. Thousands of workers participated in the countrywide strike, crippling traffic and creating massive headaches for commuters. About 1.5 million Indians drive for Uber, Ola and other ride-sharing companies. On Monday, many of them refused to work. Thousands of workers participated in the countrywide strike, crippling traffic and creating massive headaches for commuters. The drivers say they have no other choice: They're simply not making enough money to survive. Many can't even afford to make car payments. 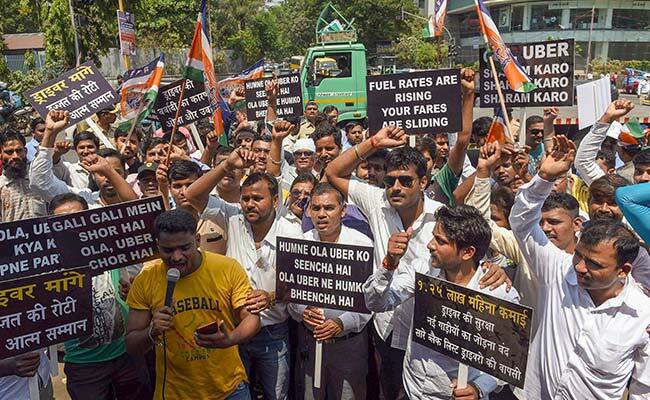 "Drivers are in huge debt," said Sanjay Naik, president of the Maharashtra Navnirman Sena political party's transportation union, which organized the strike. It was so appealing that some salaried workers quit their jobs to drive. Farmers sold their land and bought cars instead, often on credit. But the promised rewards never materialized. The huge influx of willing drivers meant ride-sharing companies didn't have to compete so hard to woo drivers. At the beginning, drivers said companies took a 10 percent commission from every ride. Now, drivers say, they're forced to give back up to 30 percent. They are also unable to set their own prices, meaning their fare earnings suffer when Uber or Ola (a locally grown competitor) offer promotions or cut rates. "We are not able to meet our needs from Ola and Uber," driver Tanveer Pasha told Quartz. Pasha said he makes about $10 a day, and nearly all of that money goes to repaying car loans. "I can't live on the remaining Rs200 [$3] and run a family," he said. The workers say they'll strike until Uber and Ola commit to paying workers their promised $1,500 a month. They're also calling on the companies to stop low fare booking. And they want some drivers, dropped because of low ratings, to be rehired. Uber did not return an email asking for comment. Ola told news outlets that it would wait to see how the strike progressed before weighing in. Last year, ride sharing companies made $371 million in revenue in India. Experts predict that that number will balloon to $761 million in the country by 2022. But it's not easy. As The New York Times documented last year, there are several challenges particular to India that Uber and others have had to overcome. "Throughout the country, the roads tend to be terrible; clogged with traffic, potholes and pedestrians, marked by ever-shifting routes and a freewheeling interpretation of automotive rules that is almost balletic in its lawlessness," the Times explained. "India's cellular networks can be spotty and slow, and banking, credit cards and other financial mainstays cannot be taken for granted. . . . Not only are many of Uber's drivers here unfamiliar with smartphones, some are illiterate. Often, drivers and riders don't speak the same language."